Kill Bill meets Buffy in this supernatural samurai tale. Rileigh Martin would love to believe that adrenaline gave her the uncanny courage and strength to fend off three muggers. But it doesn't explain her dreams of fifteenth-century Japan, the incredible fighting skills she suddenly possesses, or the strange voice giving her battle tips and danger warnings. While worrying that she's going crazy (always a reputation ruiner), Rileigh gets a visit from Kim, a handsome martial arts instructor, who tells Rileigh she's harboring the spirit of a five-hundred-year-old samurai warrior. Rileigh is a pretty normal girl, at least that's what she thought until the night she got attacked by three muggers and she kicked their butts with her martial art techniques - skills she didn't even know she had. Katana had so much potential. I mean, Kill Bill meets Buffy! Could a bok get any better than that? However, it didn't deliver. Katana's blurb left me with incredibly high expectations and just fell short when I read it. To begin with, I couldn't find myself liking or getting attached to a single character. Not even one. Most of the time, I just found Rileigh extremely annoying. She was fake and an unrealistic portrayal of a teenage girl. Even Quentin was painted as a stereotypical version of a gay guy which just didn't seem believable. He didn't contribute to the plot in anyway, and honestly,it was just frustrating to read about them. 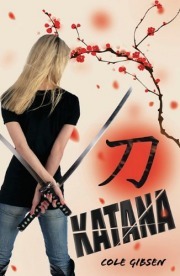 For a book with so much promise, Katana was too cliched and the writing just didn't manage to keep me engaged. Rileigh is a bad protagonist and her mere existence in the novel stopped me from enjoying the few good things in this book, like the fight scenes. The love story going on between Rileigh and Kim, the whole being in love in their previous lives, while romantic, wasn't enough for me to enjoy. Maybe I'm just prejudiced against Rileigh, I didn't even think it was possible for me to dislike a character so much. But then again, I had really high expectations for Katana and I guess it's just the disappointment that's made me give it a poor rating. If anyone picked up this book without any assumptions or clue about the plot, they'd probably enjoy the book. To me, however, Katana was just too cliched and sometimes, even a little predictable.